» here comes the sun. » nail tutorial: my neighbor totoro. 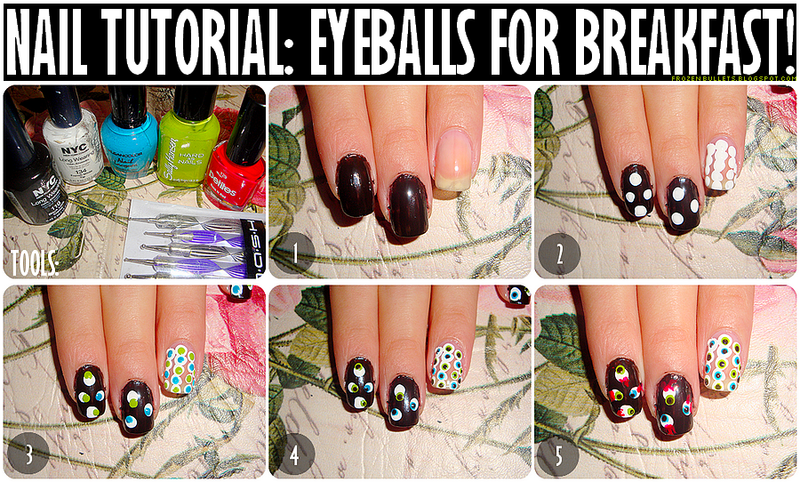 nail tutorial: EYEBALLS FOR BREAKFAST. apply your background and paint all of your nails black. i left my ring finger alone so i could use it as an accent finger, but you don't have to do this. using a white nail polish and a large dotting tool, make a couple of dots on each of your nails. for my accent finger, i basically covered the whole nail with these dots. once white dry, make smaller dots inside the white ones with your desired eye color. i decided to use two eye colors--blue and green. then wait for it to dry. then make even smaller dots inside your colored dots with black. this will be the pupil. still using your small dotting tool, grab the red color and make about 3 squiggly lines at the ends of your eyeballs. this will make is seem like the eyes were ripped out from their sockets! (i skipped this step on my accent finger.) it's ok if some of the red touches the white--it looks better this way! (optional) if you want to add some "life" to your eyeballs, make a super small white dot the the corner of your pupil. this will be a highlight. ★ instead of polish, i used white acrylic paint for faster drying. [edit:] i changed the title layout. i like it better.